This is a brand new release from Fortis in a limited edition of 100 pieces and features a ceramic bezel. Fortis has also created the same watch with a steel bezel in a limited edition of 100 pieces. 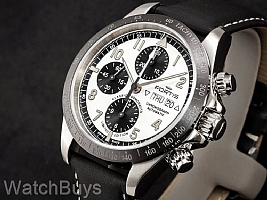 And finally, Fortis has designed a new ceramic bezel for this watch with tachymeter. The Fortis Classic Cosmonauts Chronograph Ceramic Limited Edition features a 42 mm case with complete chronograph functions and a ceramic bezel. The matte black ceramic bezel perfectly complements the case design and finish, providing balance to the watch as a whole. Integrated into the bezel is a tachymeter which can be used for speed calculations. This watch is fitted with a Fortis black calf leather strap with white stitching and a signed Fortis steel tang buckle.